It’s been said that librarians take their love of books to the extreme. In this story, Miss Devine, a bun-wearing bibliophile, has a passion for literacy that reaches new heights. She has actually chewed on a word, claims one small witness to this outrageous event. What is that word? 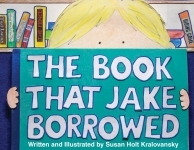 Extolling the virtues of reading, this book offers a giant look at what happens to a well-read child. 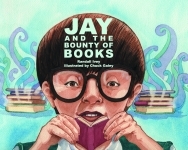 Not only does Jay’s knowledge expand when he revels in reading, but so does his size. How he gets back to normal scale teaches the act of sharing, another desirable quality. 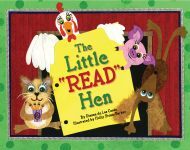 When the Little “Read” Hen’s friends won’t help her write an “egg-cellent” story, she doesn’t let it ruffle her feathers—she just does it herself! Readers of all ages will laugh aloud at the determined Little “Read” Hen as she coops herself up and cracks open her books for research. Comedian Steve Harvey and crime-stopper Roopster Roux once again team up to bring justice to the town of Woodville. The villain Victor Vain has a potion that will make everyone in the world look exactly like him, and he has already unleashed it on the citizens of Woodville! With the residents distracted by the chaos of looking identical to one another, Vain and his sidekick, Cheesecake, conduct a major robbery. It is up to Steve Harvey and Roopster Roux to return Woodville and its citizens to normal and stop Vain from fulfilling his egomaniacal goal! This action-packed tale is ideal for reluctant readers, who will enjoy the pun-slinging fun with Steve Harvey, star of the former television series The Steve Harvey Show and current host of the syndicated morning radio show by the same name. As an actor, entertainer, and philanthropist, Mr. Harvey continues his unending commitment to furthering opportunities for children and young adults throughout the country with generous contributions from the Steve Harvey Foundation.